Italy’s far-right Interior Minister Matteo Salvini on Wednesday (9 January) said populists from Italy and Poland should spark a “European spring” to replace the centre-right influence of Germany and France, ahead of May’s European elections. The May poll could see nationalist and far-right parties across Europe upset the bloc’s balance of power, which is currently dominated by the centre-right. His talks with Kaczyński had been “long, positive and concrete”, he added. PiS spokeswoman Beata Mazurek said on Twitter that talks between Salvini and Kaczyński, “opened the way for further contacts on speeding up the development of EU countries and providing the EU with an appropriate and strong position on a global scale”. Rome has had a series of disputes with Brussels, notably over its tough immigration policy, and last month passed a revised 2019 budget, watering down key measures to avoid being punished by the European Commission for breaching the EU’s economic governance rules. 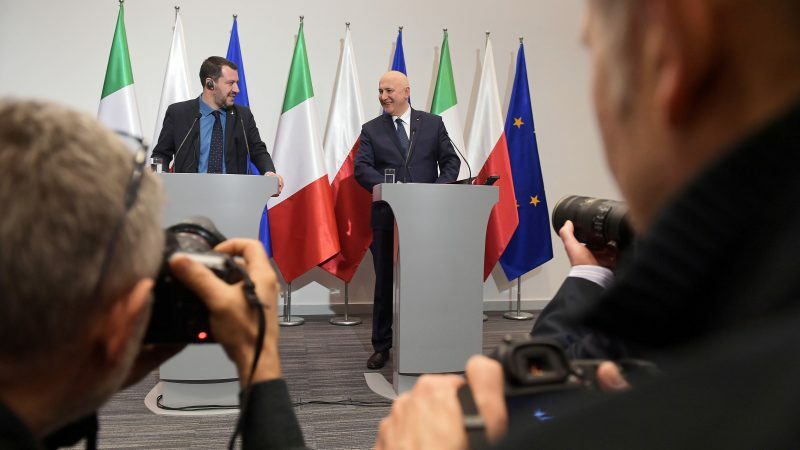 Earlier on Wednesday, Morawiecki said his government shared many of Salvini’s criticisms of the EU, and accused Brussels of discriminating against some countries. “One country has a budget deficit of 2.4% (Italy) and another country has a deficit exceeding 3% (France)… and they are treated differently because of some other aspects,” he said, referring to the budget dispute between Brussels and Rome. Warsaw recently backed down from its reform aimed at retiring Supreme Court judges, under pressure from Brussels. The EU’s top court ruled it threatened to undermine the independence of the courts.